Tobias Capwell—jouster/re-enactor, curator at the Wallace collection, and author of several other excellent works on arms, armor, and their use—presents the answer to the major research question of his early career in this beautifully designed and richly illustrated volume. The English, he argues, created a unique national style hitherto unrecognized amongst curators and historians of armor. This was based on exigencies of the “English Way of War,” which featured dismounted men-at-arms supporting archers, and meshes quite well with the observations of scholars of medieval military history concerning political and social developments around the Hundred Years’ War. Conversely, the other recognized national styles of the fifteenth century—the Italian and the German, which were exported throughout Europe—were based upon the needs of the mounted soldier. Thus, unlike the large shoulder defenses of the Italian style, which would impede the use of two-handed weapons on foot, English armors feature small shoulder defenses. Likewise, English armor was symmetrical and emphasized lightness and mobility, whereas Italian armor tended to build up the left side as befit cavalry armor. English armor also had long skirts to protect the groin, mail on the backs of the legs, and other elements intended to protect the wearer while fighting on foot. This quite refutes the general historiographical consensus that there was no unique “English style” and that the English were reliant on armor and armorers imported from the continent before Henry VIII established the Royal Armouries in Greenwich in the sixteenth century. The work is split into two main sections, with the first covering armor from 1400–1430, and the second from 1430–1450. Capwell bases his argument on a deep examination of visual sources, primarily funerary effigies. Though effigies do provide us with an idealized depiction, many more survive than do actual pieces of armor, and contain context and cultural cues that are missing from objects. Further, Capwell points out that effigies tend to have technically accurate depictions of armor that correspond to the subject’s class, status, and wealth. The methodology is thus both sound and scientific. The book thus also forms a comprehensive visual guide to the development of arms and armor in England in the first half of the fifteenth century. Armor underwent massive changes in this period, from the fourteenth-century style that used smaller plates, fabric coverings, and larger sections of mail, to the fifteenth-century “white” armor that used metallurgical improvements to create a full exoskeleton of steel. All of these developments are shown by wonderfully clear schematic illustrations by renowned armorer Jeffrey D. Wasson, The book also includes an index of arms and armor terms and, as an appendix, a pictorial essay on the forging of the author’s own harness by renowned modern armorer Robert Macpherson. Thus, non-specialists in arms and armor should have no fear about following Capwell’s argument. Unfortunately, the ideas underlying the thesis of Capwell’s book—national history and the idea of national styles in armor as in art—has fallen into disrepute in some academic circles. The important themes in the twenty-first century are interconnection and multiculturalism, not ethnogenesis and the creation of unique national cultures. This is unfortunate, but we cannot blame an author for not including a perspective that is hardly germane to his subject matter. Though Capwell points out that the English were influenced by continental styles, and in turn influenced their adversaries and allies, I fear that this work will not be widely read outside specialist circles. 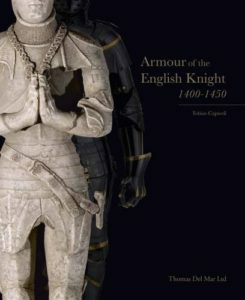 In sum, Arms and Armour of the English Knight is, besides being a comprehensive guide to its subject matter, an important contribution to the historiography of arms and armor. To the grand overarching idea of “Italian” and “German” styles, we must now add an “English” style. I look forward to seeing what Dr. Capwell will produce in the next phase of his career.